Recently Tom has been talking about how much he misses New Orleans and the foods there. For two years before we went, he had a trade show there for work in October. Of course now that we’ve both been and I absolutely love the city, the trade show has changed cities and I can’t tag along with him. Anyway, we’ve been talking a bunch about all of the food we had while in New Orleans and what we still need to have whenever we manage to go back. 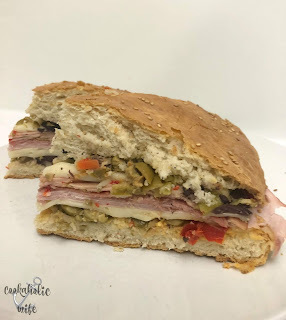 One of the things we didn’t get to enjoy was a muffuletta sandwich. The Muffuletta Sandwich is a New Orleans classic. 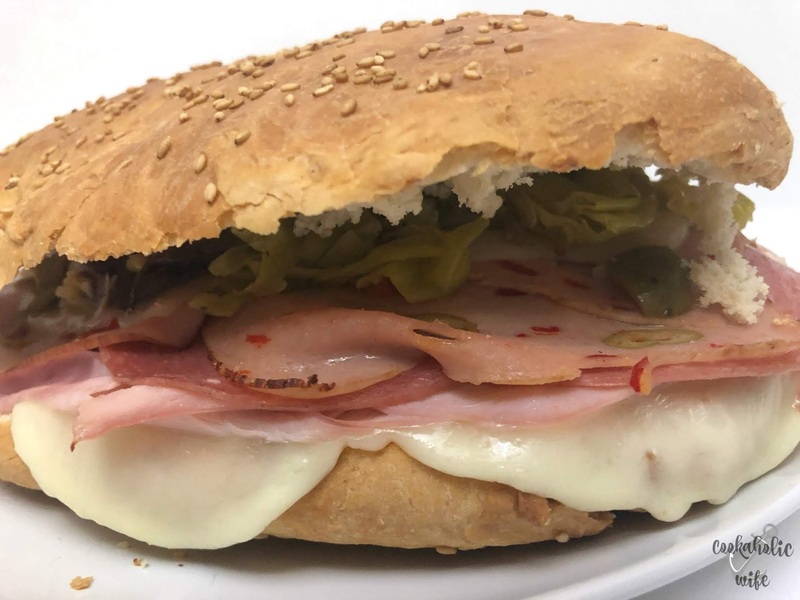 It’s served on a large round roll covered in sesame seeds and the sandwich is made up of genoa salami, ham, mortadella, Swiss cheese, provolone cheese and an olive salad made with black and green olives, fresh herbs and a giaridinera vegetable mix. The best place to get one is at the Central Grocery Co on Decatur Street in the French Quarter. We walked past this place approximately 6 times in the 3 days we were there and for some reason, each time was right after we had ate and there was no room to eat anymore. I still regret this. I’m not even joking when I say that my first stop as soon as I return to New Orleans will be the Central Grocery Co to get a quarter of this amazing sandwich. 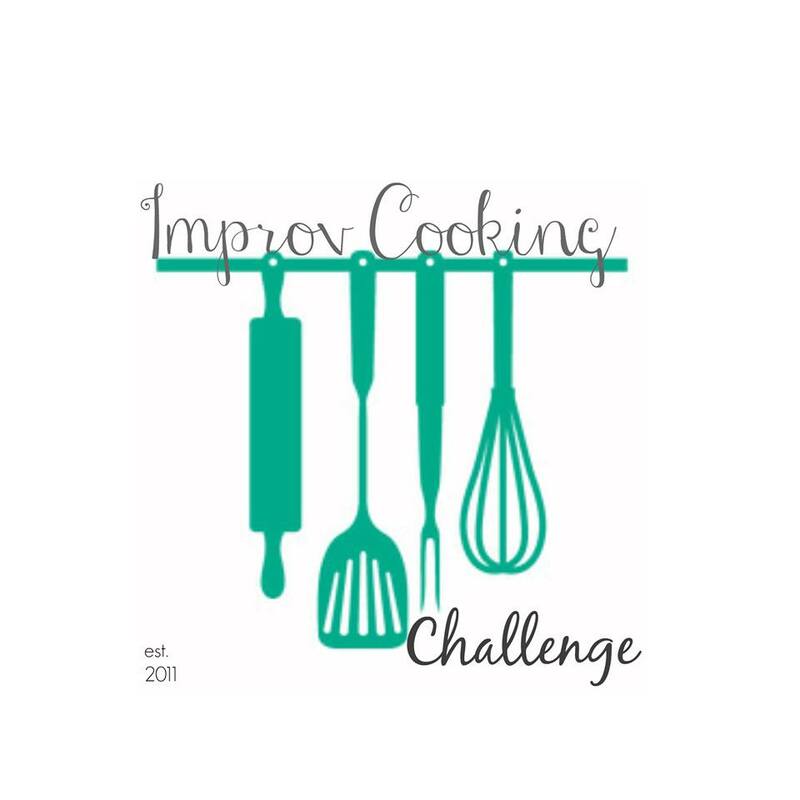 The ingredients for this month’s Improv Cooking Challenge were olives and cheese. I’m so glad Tom suggested this recipe because, since I’m not a fan of olives, I was really struggling on what to make for this event. A classic New Orleans sandwich full of deli meats, cheese and a tangy olive spread. 1. FOR THE BREAD: combine warm water, sugar and yeast in a bowl. Set aside for 10 minutes. 2. Add the flour, salt and shortening to the bowl of a stand mixer fitted with the dough hook attachment. When the yeast is foamy and 10 minutes have passed, pour the yeast mixture on top and mix on low speed until an elastic dough forms. The dough should be smooth and satiny. 3. Oil a bowl and place dough in it. Toss to coat, cover with plastic wrap and set in a warm place until it has doubled in size, about 1 ½ hours. 4. Lightly flour a work space and turn out the dough, punching it down. Form into a 10-inch round loaf and place on a parchment lined baking sheet. Sprinkle the top with sesame seeds and press them into the dough. 5. Allow to rise again for 1 hour. 6. Preheat the oven to 425 degrees. Place the bread on the middle rack in the oven and bake for 10 minutes. Lower the temperature to 375 and continue baking for 25 minutes. 7. Remove from the oven and allow to cool on a wire rack for at least 20 minutes. Slice in half. 8. FOR THE OLIVE SALAD: Dice up the olives and giardinera. Toss in a bowl with the fresh herbs and just enough olive oil to keep it coated. Refrigerate until ready to use. 9. 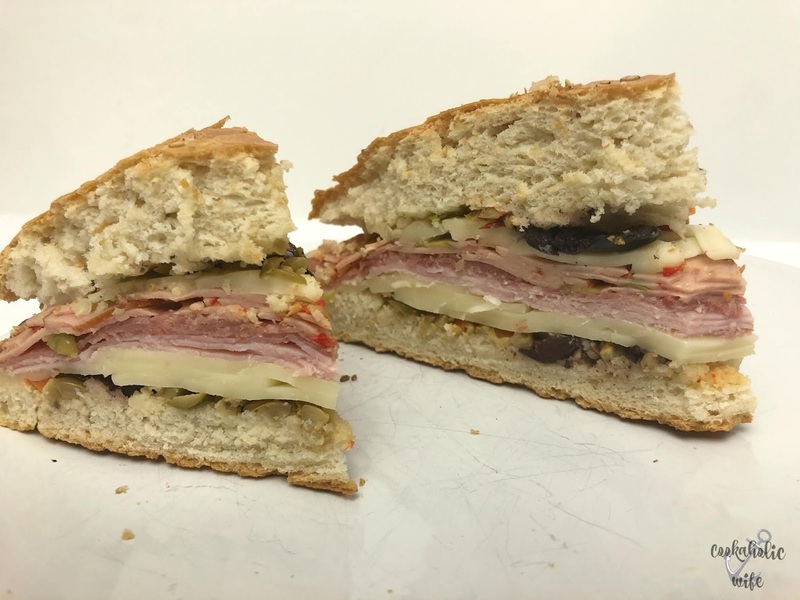 FOR THE SANDWICH: Remove any excess bread from the center of a sandwich on the top and bottom half of the loaves to create a spot to fill with the olive salad. 10. Layer the provolone cheese on the bottom of the sandwich. Follow with the genoa salami, the ham and the mortadella. Top with the mozzarella cheese. Place the top half of the loaf filled with the olive spread on top. 11. Slide a piece of wax paper underneath the sandwich and wrap it up. Press a cutting board or other medium-weight item on top of the sandwich. Allow to sit for 10-20 minutes for the bread to absorb the olive mixture. 12. Cut into wedges and serve. Optional: sandwich can be toasted at 350 for 15-20 minutes to melt the cheeses and warm up the deli meats if desired. If you are making the muffaletta bread, make it first as it has two rises before it can be baked. Seeing as I’ve only had my own version of the muffuletta, I can only imagine how much better the real thing is going to be. The bread is crusty on the outside, but soft in the inside. The meats and cheeses provide a nice salty flavor which is rounded out by the olive salad. Not too salty, not too dense, not too cheesy or meaty, it’s really just an incredible sandwich…and this coming from someone who doesn’t like olives at all! The #ImprovCookingChallenge is a monthly blogging event where two ingredients are assigned to a month. Bloggers can make any recipe they like as long as it features the two ingredients. If you are a blogger and would like to join us, please visit our Facebook page. You can also read more about the event on our home page. If you’d like to see previous creations, check out our Pinterest board. Yum, I need to try this! OH YES!!! Now, this is a sandwich!!! I too need to try this mouthwatering sandwich! They look delicious Nichole that too with homemade bread..Wow!! Muffaletta was a great choice Nichole. And very impressed that yo even made the bread.